Walking into your nearest office supply store to buy a new printer for your office probably isn’t the best decision because a basic home device won’t do the job. 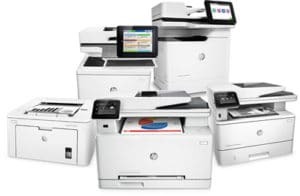 Business printers need more features and sophistication to be efficient. Most offices find that they need a networking printer so employees can share without needing an individual printer on everyone’s desk. Business printers need to be able to scan, print, copy, and fax. Take these factors into consideration when selecting the right printer for your business. LED and laser printers are the two very similar and common types of printers used in offices that dominateprinter sales. They transfer toner to the printer using light and a rotating drum. They make high-quality prints rapidly, and they contain software and hardware that is optimal for networking purposes. Toner is more affordable than some other printing methods. The main drawback is that they’re less-than-ideal for photo printing. Solid-ink printers are a better option if you need to print photos or in color often, but they smudge easily. They aren’t as common, which makes it harder to find the right model to suit your needs. You might think that a wireless connection is the best option because you don’t need to worry about cables. Businesses have more specific needs than your home printer. Wired networks are more secure, reliable, and faster than wireless networks. Businesses, large and small, are expanding their capabilities to allow their employees to print from mobile devices or remotely from their homes if they choose to telecommute. Printers with more advanced features and capabilities don’t come at a low cost, so it might be more economical to lease a printer instead of buying one. You’ll pay more overall due to fees and interest, but you’ll have up to 60 months to pay back.